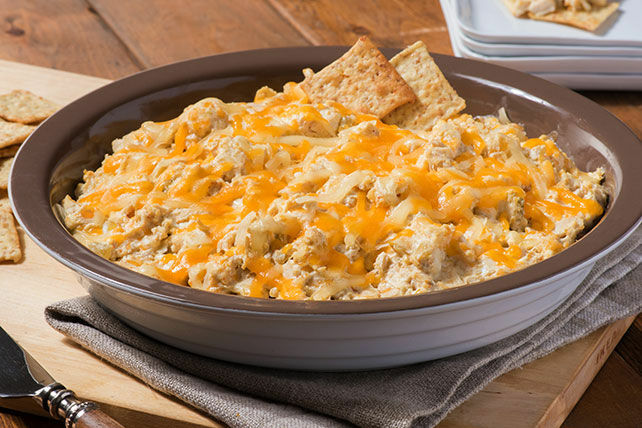 Here's everything you love about cheesy, chili-spiked chicken enchiladas, all in one tasty dip! Beat cream cheese, 1 cup shredded cheese, chilies and seasonings in small bowl with mixer until blended. Stir in chicken. Spread onto bottom of 9-inch pie plate. Bake 20 to 30 min. or until heated through. Sprinkle with remaining shredded cheese; let stand 10 min. Garnish with chopped tomatoes and green peppers just before serving.